If you have received a removal order from the Canadian government, it is very important to do your research into what this means for your return to Canada. Depending on the type of removal order you have received, you may or may not be inadmissible to Canada. Whether or not you are inadmissible to Canada also depends on whether or not you complied with the removal order you received. Throughout this article, we hope to help you better understand how to deal with your removal order so that you may return to Canada, depending on your specific situation. A departure order is a notice which instructs an individual to leave Canada within 30 days of receipt. Upon exiting, you must inform a Canadian immigration officer that you are complying with the order, to avoid being documented as non-compliant, and wind up needing authorization to return anyways. However, if you do comply with these requirements and properly leave the country as per your departure order, you will not need authorization to return to Canada, otherwise known as, as ARC. An exclusion order is a notice which also instructs an individual to leave Canada within 30 days of receipt, but additionally instructs them to remain out of the country for at least 12 months. Again, with this type of removal order individuals must inform a Canadian immigration officer that you are complying with the order, to avoid being documented as non-compliant, and wind up needing authorization to return. In this case, the day the individual leaves must be documented so that the 12 month period can begin. Ultimately, if you do comply with the order and do not attempt to enter the country before the 12 month period has passed, you do not need authorization to return. A deportation order is a notice which instructs an individual to leave Canada immediately. Anyone who receives a deportation order requires authorization to return to Canada. In other words, they must apply for an ARC. This is not actually considered a removal order. Therefore, you need not apply for an ARC to return to Canada. If you have determined you will require an ARC to return to Canada, it is important to understand the application process. This is an important application to understand because, like any application to overcome inadmissibility, it is up to the discretion of the officer reviewing the case to determine whether or not you will be permitted to enter Canada again. Therefore, it is important to ensure you prepare a well-put-together, complete application. if you received a departure or exclusion order and did not comply, are seeking entry to the country before your 1 year ban has passed, or, have been the subject of a deportation order, you will need to apply for authorization to return to Canada. But first, to prepare for this, you must also prepare an application for a temporary resident visa. Any individual submitting an ARC or a TRP who is not from the USA must also submit an application for a temporary resident visa. An explanation of the reasons why you want to enter Canada. It is essential that you have taken all the aforementioned information into consideration, especially if you have been issued a deportation order and are applying for an Authorization to Return to Canada (ARC). 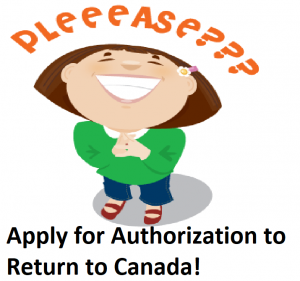 If you would like to apply for an Authorization to Return to Canada (ARC), it is extremely important to note that these are difficult applications to pursue on your own. Therefore, it is highly recommended that you seek out professional and experienced help prior to submitting the Authorization to Return to Canada (ARC) application. Here, at Akrami & Associates, we work and have experience with many different immigration matters. We have helped many of our clients re-enter Canada with the assistance of an Authorization to Return to Canada (ARC) application. If you believe that you may be eligible to apply for an Authorization to Return to Canada (ARC), please feel free to contact Akrami & Associates at our office at 416-477-2545 for more information or if you would like to book a consultation with an immigration professional for more advice. With Akrami & Associates, there is always a way!